I’ll never forget the day my mother came back from the doctor’s office. With a simple shake of her head our lives changed forever. There are no words available to properly describe the feelings that came over us that day. We knew nothing of what to expect, what was to come or how we would get through it; just that we would. Looking back it seems like things moved in a rather fast kind of pace, though at the time things seemed to progress in slow motion. It was surgery; recovery; surgery; recovery; treatments; recovery – repeat. I have never been so proud as I was of my mother at that time. I was a 16 year old young girl; only child to boot; watching my mother battle this disease with a vengeance. She held her head high, never stopped smiling, and fought with every ounce of strength she had in her. Courageous and brave seem lacking when looking for words to encompass what she was; or rather still is. I; thankfully; have not personally been hit with this type of cancer, but should that fateful day ever come I can only hope to have the confidence and success my mother carried all those days. Since this time my mother’s two sisters have also fought their battles (and won) and my mother has been hit with the big C again (and won) as have one of her sisters. 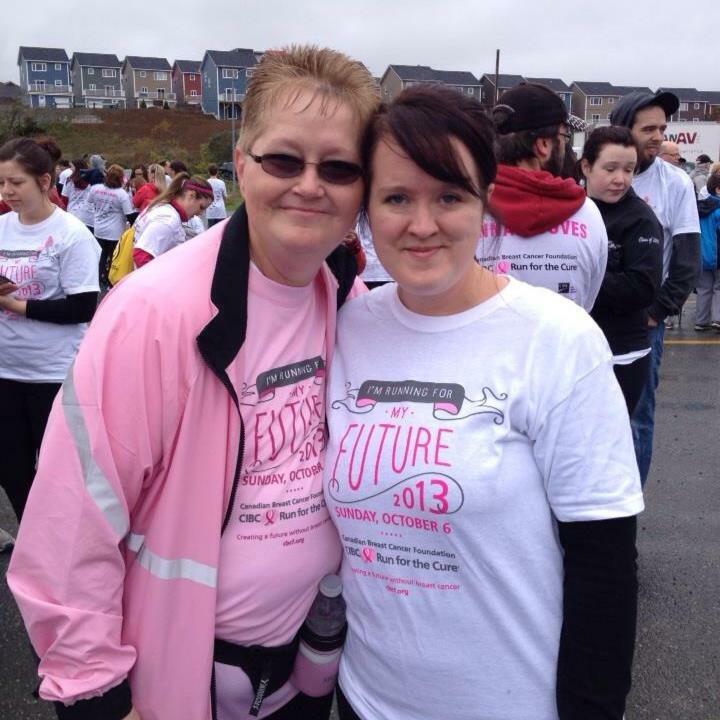 Last year; 16 days after I walked with my mom in the CIBC Run for the Cure 2013, I received a diagnosis of a different type of cancer. I was so very fortunate to have had a wonderful medical team look after me; things were caught early and here I am, ready to continue walking with my mom. My mom will be celebrating a magnificant milestone this year; 13 years Breast Cancer free. And like every year; I am so ever thankful to be by her side as we continue our walk towards a future without breast cancer. So when someone asks me what I’m running for; or who, my answer is simply – every woman; every child and every man who has been touched by this dreadful disease. Let us all walk towards the day we can breathe easy when getting a mammogram. Let us all walk towards a day we can tell our children or grandchildren about the great disease that WAS!! God Bless you all. I have many friends who have had cancer and so far they have all been survivors. One friend has had breast cancer 3 times, ovarian cancer and brain cancer. I got to a point where I was afraid to call her house. She has survived it all and always optimistic. She’s doing wonderful and is now cancer free. I always worry when I go for my mammogram which is due now. I pray you are all well and will remain in great health. As my friend always said ” I beat it before and I’ll do it again”.